There are 866 items available. Please enter a number less than or equal to 866. These really give you a proper shave. I found an old Gillette razer holder in the back of a cupboard, and thought that I'd have an old type shave. I had forgotten just how well these shave you, the modern 2 or three blade are nowhere as good, I normally need two blades to get a decent shave, but with these Gillette razer blades, I get at least two shaves per blade, no scratching, no pulling, it almost feels like a spoon being rubbed over your face, I don't even need shaving cream, just a nicely wet face, but the blades last longer when cream or foam is used. On the surface they are great value !! It works well. You'll get 20 blades and a holder, which is *great* for the price. If you're looking for a catch to the price here, I haven't found one. Caught and cut all my hairs, pretty easily. If you're new to using older-style razors, you'll find this a great value test kit. 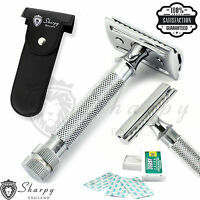 I bought this as my replacement travel bag razor and have tested it several times. Very happy. 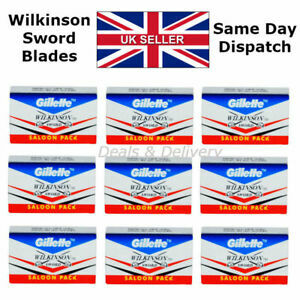 Wilkinson sword blades perform roughly as expected (they tend to run pretty sharp generally) and the holder I received is fine. I'd say if you're in the market for something straightforward this will do the trick. Usual caveats apply about being careful when first using double edge razors (preparation is key - and then blades glide through). I'd happily buy this again if I needed another. I use Derby blades more often, but these blades are great for coarse hair. Blades still reusable for another day in my case, too. Often better to replace every day, but your mileage may vary. Thanks again to the seller. Nice close shave but take your time! I bought this set because I wanted some razor blades for slashing the top of bread before baking! So rather than just buying blades, for a small additional cost I thought I'd try "old school" shaving. These razors work very well indeed! A much closer shave than disposable razors although you need to take a bit of care, not that I've cut myself yet! Touch wood! I'd recommend this set to anyone, and so far the razor blades are staying sharp, I'm still using the first blade! if you are starting out in the DE wet shaving world this a great razor to start with..wonderful.